Nokia has just announced the launch of a netbook in a press release, Nokia Booklet 3G brings all day mobility to the PC world. This means that Nokia anticipates the fabled Apple tablet, always in the press but not announced yet. Nokia netbook is Windows based. 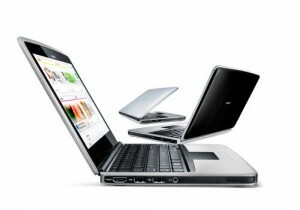 In this convergence there is also Google with the announced Google Chrome OS an operating system targeted to netbooks. Simplifying a bit, Apple is fully integrated, Nokia is expanding vertically in Internet services and horizontally in the netbooks, Google and Microsoft are everywhere there is software. The netbook space is pretty crowed and competitive with Dell, Asus, Acer, HP, Sony, and several other Chinese and Tawainese manifacturers. Dell has also launched its own model of mobile phone based on Google Android. In the meanwhile, operators open their own App and music stores , for example Vodafone, China Mobile, Verizon Wireless are all launching their own stores. Google has created the Google Voice application for the Apple Store and Apple rejected it, at least It has not accepted it yet. Spotify has created and submitted the Spotify iPhone application that would directly compete with Apple iTune. The question then is Will Apple Open the iPhone to Rival Spotify? Let’s not forget that Spotify has financing also from music labels willing to limit the bargaining power of Apple iTune. UPDATED: Apple has approved Spotify for the App Store! We are seeing several tactical moves made in order to prevent competitors to take an advantage in this uncertain environment. Nokia is re-entering the PC market. In fact, in the mid 1980’s Nokia had a PC division, and merged it with Ericsson Information Systems. The merged company, Nokia Data was later sold to UK based ICL in 1991 – and later became part of the larger Fujitsu group. 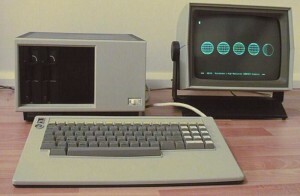 Nokia Data’s most notable computer was the MikroMikko 1 – which was sold around the world. The price of the Nokia booklet has not been announced yet and Nokia stocks did not react that much. The price is important because it will show how this product is positioned in the market place. Certainly, not in the low end where Taiwanese and Chinese manifacturers are fighting with a low cost strategy. In the high-end there could be the Apple Tablet. The middle range is crowed with the rest of the pack. The Booklet is likely to be sold by mobile operators bundled with a data tariff the FT reports. In Europe, wireless service providers account for more than 25% of all netbooks sold, according to consultant IDC writes BusinessWeek. Sales of handsets should decline 10% this year, according to Nokia own forecasts and netbooks is a growing segment in the PC market. Netbooks, which first appeared on the market about 18 months ago, are expected to make up a third of the 46 million portable computers that will be sold this year in Western Europe, according to the International Data Corporation. Western Europe is the biggest market for the devices, accounting for 70 percent of global sales, I.D.C. said. The market in Western Europe is dominated by two Taiwanese manufacturers, Acer and Asus, which combine for 49 percent of sales. Samsung of South Korea and two American computer makers, Hewlett-Packard and Dell, combine to sell 32 percent. That netbooks would offer good margins may seem counterintuitive. After all, traditional PC industry’s margins are razor thin. But consider: In its latest, second quarter, Nokia’s devices and services business’s margins hovered around 4.3%. PC maker Hewlett-Packard’s operating margins in personal systems, which encompass PCs and notebooks, fell to 4.6% in the quarter ended July 31. So, in actuality, Nokia’s and H-P’s financial metrics are not that different. Meanwhile, netbook margins should be fatter. Here’s one reason: Nokia’s Booklet comes bundled with Nokia’s Ovi services, which will, in the long run, allow Nokia to make additional revenues on mobile e-commerce and extra features. The big question that remains: Will consumers love Nokia’s netbook? Nokia has a strong brand and a loyal following in most global markets, except for the U.S. Some of the references cited are Contribution Patterns Among Active Wikipedians by Seth Anthony and Who Writes Wikipedia? by Aaron Swartz. The Rise of Collaboration is a theme at Ted.com. A collection of inspirational talks from the people involved in making our world more connected and social. Made to Stick: Why Some Ideas Take Hold and Others Come Unstuck by Chip and Dan Heath is an interesting reading. At first glance you would say that´s clear, but to really create an effective message requires a lot of efforts. The book is an easy reading and very well written. I would recommend to anybody who wants to improve the communication and make ideas “stick”. See also my post The importance of the soft issues: communication, negotiation and leadership. Google’s view on the future of business: An interview with CEO Eric Schmidt on How the Internet will change the nature of competition, innovation, and company operations by McKinsey Quarterly. And this week Schmidt left the Apple board given the increasing conflict of interest between the two companies competing now in the same space. News coverage from NYT Google Chief Gives Up Board Seat at Apple and Google CEO Schmidt leaves Apple board. New opportunities to innovate are created when the industry structure change but not everybody is happy about it. The latest news is about Apple’s ban of Google Voice. The FCC investigates Apple’s ban of Google Voice by FT article. The news is reported also by BusinessWeek, iPhone Apps: What Makes Apple Say No? and TechCrunch Apple Is Growing Rotten To The Core: Official Google Voice App Blocked From App Store.